PhazPak's New "I" Model "Build-A-Phase" Phase Converters, Completely Simplifies Rotary Phase Conversion. It eliminates the need for a pick-up relay or timer relay, starting capacitors and complicated hook ups. PhazPak "I" Model "Build-A-Phase" converters are 100% Solid State-No Mechanical relays to fail. 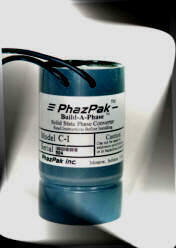 PhazPak "I" Model "Build-A- Phase" converters are economically priced too. In most cases they are less expensive then the old mechanical way. PhazPak's NEW "I" Model "Build-A-Phase" Converters---The New Better Way To Build Rotary Phase Converters. I Model "Build-A-Phase" units are also available in complete Pre-Packaged units.